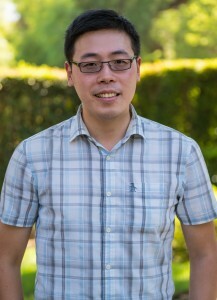 Prof. F. Xiao and students developed the guide. The Pomona College Chinese Pronunciation Guide is something that I was very interested in developing both as a Computer Science and Chinese language student. I was eager to take on the challenge of building my own website from scratch, something I had never done before, and to help out introductory Chinese students with one of the most difficult aspects of acquiring Chinese: pronunciation. I am happy that I was able to team up with Professor Xiao, Edward Gao, and Nina Zhou to create what I believe is a truly useful learning tool for students new to the Chinese language. The Guide covers pronunciation of all new words in the textbook Integrated Chinese (3rd) Level 1 and 2. Indexed by lesson, each new word has four audio recordings and requires the user to choose the correct one (see banner image above). The built-in reset button for each word allows multiple uses of the exercise and minimizes practice effect. Professor Xiao is also a contributor to the LACOL Language Skills/Diagnostics Dashboard project.